What are the pros and cons of Internet of Things? The internet of things (IoT) is the current hot topic, which is emerging as a crucial technology of the present-day dynamic world. The inter-networking of physical electronic devices, objects, and machines which are connected with distinguishing identifiers and holds the potential to communicate data over a network. Presently, about 20 billion things are associated with the internet, and by 2020, the number is expected to grow till 50 billion. The wide range of services and intelligence put into the platter is capable enough to alter the routine lives of masses and offer benefits of the internet like the maintenance of cities, crop growing patterns, and healthcare facilities. Uses of the Internet of Things (IoT) can be traced in different spheres, depicting its remarkable development. Although, the fact which can’t be ignored is that, still there are various cons of the internet and struggles bestowed in the applications of the Internet of Things (IoT). It is backed with the amalgamation of software and hardware, consultation and algorithms which enables it to come up as an intelligent technology. Internet of Things (IoT) has background intelligence which improves it’s potential to respond in a smart manner under specific circumstances and helps to run a certain task. Irrespective of, being called an intelligent technology, Internet of Things (IoT) remains as a communication channel between devices, where the interactions between the device and user are performed through standard input techniques and graphical user interfaces. Interconnection supports the Internet of Things (IoT) by binding routine tasks and objects. Linking these objects is a crucial task as the level of individual object interaction helps in advancing towards compiled intelligence on the Internet of Things (IoT) network. It permits network compatibility and easy access to things. Fresh market trends can be developed over the Internet. The core task of the Internet of Things (IoT) is to assemble information from relevant sources, in accordance with the ever-changing scenarios, taking place around the device. The situations of these devices alter quickly based on whether they are connected or not, locations speed or temperature and much more. Along with the situation of the device the proportion of connected devices also alter rapidly with time, place and person. Internet of Things (IoT) nearly seems impossible without the use of sensors which support in diagnosing and measuring any alterations which take place around the device to produce information that outlines on their status and communicate with the surroundings. Sensing technology offers the way to develop potentials to showcase awareness of the world and the interaction of people. The sensing data is the liner input taken from the physical world but it offers a great deal of comprehension of the complicated environment we reside in. The devices of the Internet of Things (IoT) are prone to various threats and security issues. While availing benefits of this intelligent technology it is not wise to ignore the security disadvantages of an internet of things. An extensive range of privacy and transparency problems are linked with the Internet of Things (IoT). It is essential to protect essential data and network channels while playing around the IoT. A massive range of technology plays their respective roles in the IoT and enables its successful execution. Let’s illuminate the potential applications of the Internet of Things (IoT). This stands out to be the most famous advantages of the internet of things which help developers to offer an optimum, convenient and secured smart home mechanism. The user can easily manage the lighting system of their homes through a remote to build up a sense of being inside the home while they are enjoying their vacations in a foreign land. It also helps the user to switch on the air conditioning system of the house before they step in to optimize the temperature, and also record a television show while they are busy doing other things to watch it later. With the emergence of a fresh set of technology, some big firms are striving toward offering intelligent lighting solutions which will permit the user to manage the hues of lightning as per the mood. Wearables held a significant place in the IoT mechanisms. Similar to smart homes, wearable is a trending buzzword for an IoT application. People, eagerly wait every year for the launch of a fresh series of Apple’s smartwatch. Besides this, there are a plethora of other kinds of wearable devices which proves to be very handy such as B Trainer or LookSee bracelet. Hotels are aiming towards the potential use of the Internet of Things (IoT) to offer a soothing user experience by swapping card based door keys with mobile applications, they make sure to offer an enhanced level of security to the room. The heating and lighting mechanism are also linked to the Internet of Things to offer a unique user experience based on individual preferences of the clients. By linking machines and devices present in industries like oil, gas or production of power significant changes can be brought in the field of manufacturing. IoT can be utilized under circumstances where life-threatening circumstances can emerge because of the failure of the mechanism. The technology functioning in smart cars is massive and large scale network of various antennas, sensors, software and technologies help in interaction to guide in complex paths. It takes decisions based on factors such as accuracy, speed, and uniformity. These factors become more crucial while the user surrenders the entire management of brake and steering wheels to the automated vehicles. Internet of Things (IoT) has enormous uses in healthcare facilities, which ranges from controlling devices, highly developed sensors to the integration of devices. It holds the capability to enhance the way the doctor’s work and also helps in improving the experience of patients. Healthcare Internet of Things can permit patients to spend a great proportion of time communicating with their physician regarding their issues, which in turn hikes up the level of indulgence, and satisfaction. Right from personal healthcare sensors to robots to perform surgery, the Internet of things in the field of health care is responsible for linking the two ends of healthcare and technology. IoT supports in developing healthcare facilities to a new horizon and offering budget-friendly alternatives for medical experts as well as the patients. As a large scale of the agricultural task is monitored and the cattle are managed, the Internet of Things can change the outlook of people towards agriculture. Smart agriculture holds the capability to turn up as a significant application in countries where agricultural outputs are used for export. The Internet of Things can be accounted for as an iconic technology in the field of mobile app development and is offering end users with fascinating merits and characteristics. But as every coin has two sides, the same goes with the Internet of Things (IoT) also. Every fast-evolving technology has a dark facet, which should be discovered and taken into consideration while using it. So let’s check out the pros and cons of using the internet. Through the Internet of Things (IoT), accessing real-time information becomes an easy process. This works out because of the interconnection of devices, by which an individual can obtain any data across the globe. This helps individuals to function anywhere without being physically present there. Internet of Things (IoT) promotes connectivity between devices which is referred to as Machine-to-Machine (M2M) connection. As a result, a link is established between physical devices and transparency is build that eliminates the chance of inefficiencies and contributes towards better quality. Because of the link established between physical things and centralized digital control through wireless setup, massive automation and management are present in it’s functioning. Machines are capable of interacting independently with each other, resulting in rapid outputs. One of the biggest advantages of the Internet of Things is that it proves to be economical. The prices of monitoring and tagging devices come up to be less, which helps in saving some extra bucks. Internet of Things (IoT) is very handy in daily functioning as it establishes an effective connection between devices, which leads to securing cost and efforts. Permitting information to interact and transfers between appliances bring out an efficient system. In the present day, technological era, every device establishes its connection with internet. This exposes people to the threat of leaking their confidential information. It is seen as a major disadvantage of transferring data, as essential data may not be secured and can undergo unauthorized access by third parties. Internet of Things (IoT) is the heterogeneous network which links different devices. A single flaw can cause an impact on the whole mechanism. This is the most complex facet of the internet of things which have numerous impact. As every activity is being automated, the requirement for human-intensive jobs is decreasing at a fast pace. This will directly affect the employment capacity. There exist no universal standards of compatibility for the Internet of Things (IoT) which offers a tough time to devices, developed by different manufacturers to interact in a single platform with each other. Technology is having a dominating position in our routine life, resulting in the dependence of humans on technology to fulfill their needs. Just in case an error or a virus sneaks in, there exist high possibilities that every connected device will be infected by it. There is no doubt, in the fact that the Internet of Things (IoT) will alter the process of development of iOS and Android applications. Internet of Things constitutes a significant part of our routine lives. 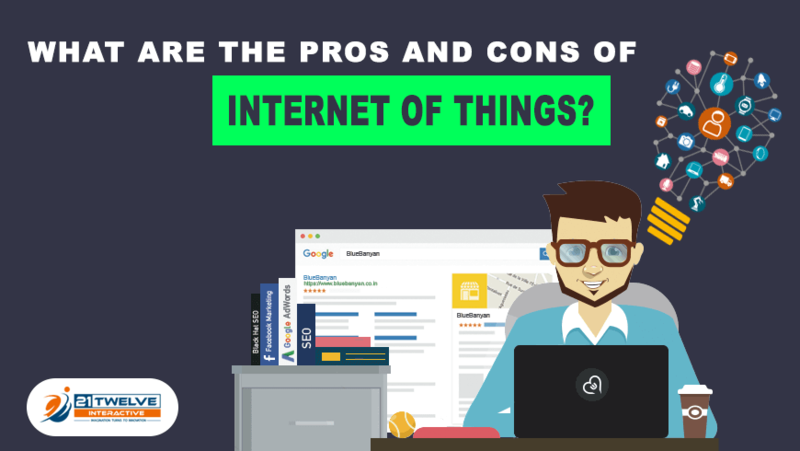 So it is essential to properly take into consideration the associated pros and cons of the internet of things. It is the need of the current hour to keep pace with the emerging technology but it is equally essential to interpret and research the dark facet of it and prepare you for the results.